Make My Trip Running Discount Offer on Hotels, They Are Offering Flat 50% OFF on OYO Hotels And Additional Discounts On It. Book Now And Enjoy Your Trip. And Pay Though MMT For Get This Offer. This offer cannot be clubbed with any other offers from MakeMyTrip. This offer is not valid on payments made through PayPal account, Cash on Delivery (COD) and EMI Options. 100% of booking amount will be refunded in case of any service issue on selected Hotel. 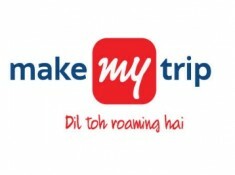 MakeMyTrip shall not be liable for any indirect, punitive, special, incidental or consequential damages arising out of or in connection with the offer.